conference | A . T . T . N ! This year’s MN eLearning Summit will happen August 2-3 in Normandale Community College. The program draft is already out and the HIED topics will range from online discussions, MOOCS, course development, telepresence classrooms, asynchronous courses, etc. Registration is open and discounted for any MN State employee ($61.25 − Enter promo code C118 at checkout, by July 14). QM Connect, annual Quality Matters conference is open for proposals by April 7. Find out more here. 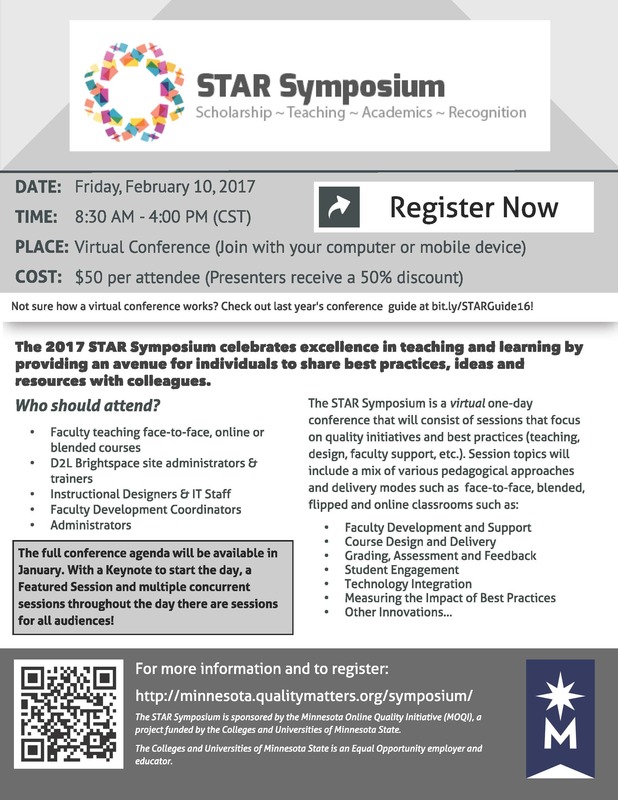 Registration is now open for the 2017 STAR Symposium sponsored by the Minnesota Online Quality Initiative. This is a virtual one-day conference that will consist of presentations focused on topics related to Faculty Development Support, Course Design and Delivery, Assessment and Feedback, Student Engagement, Technology Integration, Measuring the Impact of Best Practices and other Teaching Innovations for face-to-face, blended, and online courses. Just like last summer, the MN elearning Summit organizers encouraged the presenters to share their presentations with the broader audience. Here, you will find the various 2016 sessions materials. This year, Minnesota Learning Commons (a partnership of Minnesota Department of Education, MnSCU, and the University of Minnesota) organize another conference July 27−28 at the Minneapolis Community and Technical College. The purpose is to provide a gathering place for presenters and exhibitors focused on technology in education. You can find a detailed description here. Although it is early for the full schedule of concurrent sessions and exhibitors, you can read about the keynote speakers and last year’s presentations. Previously known as Ignite, D2L Brighstpace connection to Minnesota organizes an event tomorrow. Here is the full schedule. Among award nominated librarians from SCSU (you can read our post on library widgets here), SCSU representatives will hold two presentation sessions as well: Faculty Migration From Text-Based To Media-Rich Content: Crowdsourcing The Meaningful Application Of LMS (Brightspace) Quizzes, by Plamen Miltenoff and Marion Judish and Be Widget-Wise: Fast-Track Your Students to Academic Information by Melissa Prescott and Cindy Gruwell . Great topics are going to be discussed throughout the day, from captioning and accessibility to rubrics, discussions, and release conditions in D2L, etc. We will report on our key takeaways from this conference next week. Join your colleagues and peers, and D2L staff at the annual MN IGNITE 2016 conference on April 15, 2016, from 7:45 AM–3:50 PM at Normandale Community College. Ignite is your opportunity to connect, exchange feedback, display best practices, and network with other D2L Brightspace users. Sponsored by D2L in collaboration with Minnesota State Colleges and Universities and St. Catherine University, this conference will showcase many aspects of teaching and learning within the D2L Brightspace Learning Management System. Sessions will also feature related topics such as best practices in instructional design, technology integration and administrative management. A MN Ignite Conference is all about connection and collaboration. NEW this year is a featured keynote by Kenneth Chapman (Vice President of Market Strategy for D2L) and poster sessions including past Ignite Award Winners. With presentations, training sessions, and time for peer networking, attendees can discover how D2L Brightspace—our integrated learning platform—supports every individual’s unique pathway and potential. Did you develop a bright idea for using D2L Brightspace to enhance your students’ learning experience? Or did your team collaborate on a project to address a student, faculty, or organizational need? If so, we want to hear from you! The MN Ignite 2016 Awards, given out at the annual MN Ignite 2016 Regional Conference, recognizes educators or those in education who have used D2L Brightspace to deliver learning experiences that are innovative, collaborative, or have made an extraordinary impact on learning outcomes. Please nominate yourself (or team) by February 28, 2016, for 3rd MN Ignite Awards. Just a friendly reminder, with a full schedule following: tomorrow, Wednesday, November 18, through Friday, November 20, the Accessing Higher Ground virtual conference will be featured at St. Cloud State University. Brought to you by the Academic Technologies Team, the different sessions (webcasts) will be shown in Miller Center conference rooms 114 and 115. Pass this along to whomever you think is interested. Accessibility in learning is one of the major themes of today’s higher education. We are happy to have this opportunity right here on our campus. Finally, the recordings of these sessions will be available after the conference, and we will notify you how to get those. 1:50 p.m. – 3:00 p.m. Plenary Panel: Technology Accessibility in Higher Education — The Student PerspectiveA panel of students with disabilities from across the United States share their challenges, solutions, success stories, and ideas.